Dubai is a city that has grown enormously over the last 10-20 years into a booming hub of the Middle East. With that has come countless restaurants and cafes offering an often mesmerizing selection of cuisines. Sometimes it pays to seek a bit of local knowledge and find out some of the must-try places! The city is known more for tall buildings than big waves, but if you know where to look there is a thriving surfer community that regularly “hang ten” in Dubai. Most weekend mornings, there will be groups of children learning to ride waves and active-types paddling out past the iconic Burj al Arab on their stand-up-paddle-boards – this is Surf House Dubai. After a morning in the water, people walk up to Single Fin Café, a relaxed, surfer style eatery operating out of the Surf House headquarters. The café serves fresh, healthy food in a relaxed atmosphere that feels more like surfcoast Australia than Downtown Dubai. Just don’t tell anyone that I’ve given you one of the best local secret spots in Dubai! Try: Angela’s Super Healthy Cold Porridge: A unique combination of oats with nuts, seeds, fruits, berries and a perfect turmeric flavor. Literally a stones throw from the boats moored at Dubai Fishing Harbor is the passion project of husband and wife team, Akmal and Inez. They have created a menu based around using the best quality ingredient, allowing the flavors to be the hero of the dish – a technique they have perfected. The casual fine dining restaurant has a relatively low number of covers, allowing for greater attention to detail in handcrafting each plate and a friendly interaction with their guests. This can extend to the set menu special, where a small number of guests can dine at the bar and engage with Chef Akmal as he prepares their meal. If you are a seafood lover, this is a must try! 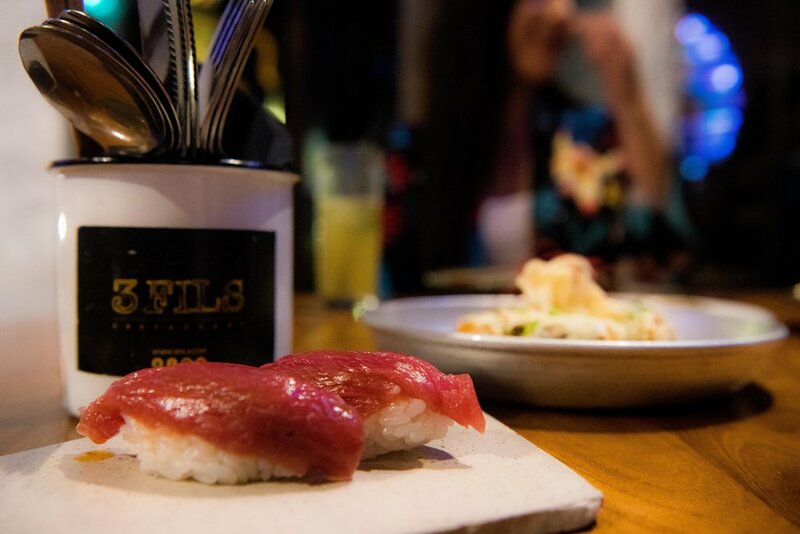 Try: The tuna sashimi at 3Fils is as good as you will find in Tokyo, so don’t miss this if you love your sashimi. Also make sure you order the Fremantle octopus! La Mer is a beautiful beach development not far from Downtown Dubai - perfect for families or those looking to spend a day on the sand enjoying the Dubai sunshine. There are a number of cafes and restaurants, as well as unique activations such as bathing boxes, street art and water sports. The Duchess is only a minutes walk from the water’s edge and offers an all-day-dining menu that is regularly introducing delightful new dishes. The modern, eclectic interior and friendly staff, create the perfect environment to relax and dine. Try: The breakfast menu is amazing and wont disappoint (order the steak, egg and beans!). If you are there for lunch, you will be hard pressed to go past the wagyu burger. They serve a great coffee, which is the perfect excuse to also have dessert! Beach-side dining at The Duchess. This place is an Instagrammers playground! A fun collection of foodtrucks, cafes, artwork and water features has been created on the outskirts of Dubai. It has become hugely popular with locals, looking for a truly unique alternative to the many cafes and restaurants in the city. If you visit on a Thursday or Friday night, it will be buzz with people sampling the many different food options. Everything from the trucks, the tables, through to the food itself is completely “Instagrammable”, so have your hashtags ready! You might find it hard to choose between trucks to order your dinner – so don’t limit yourself – grab a table and get a selection! Half the fun is wandering around and checking out all the different cuisines. Try: My favorite is definitely Mr Brisket – the pulled beef sliders are amazing! Cupagawa serves a great coffee to keep you going! Too many tourists, and residents for that matter, never visit the Old Town of Dubai – it is here where the city began as a trading & fishing port and is where you can still find so many of the authentic cultural elements. It is well worth strolling through the Bastakiya area, exploring the souks or taking a ride on the traditional dhow boats that travel up and down the creek. The entire Bastakiya area has been beautifully restored and includes many guest houses, museums and street art. 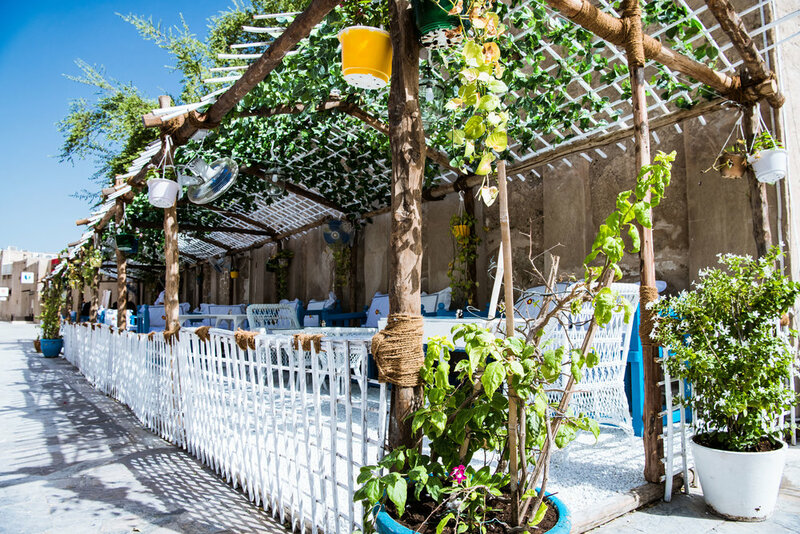 The Arabian Tea House is a must visit – it has all the charm of an authentic Arabian restaurant and serves many traditional dishes. 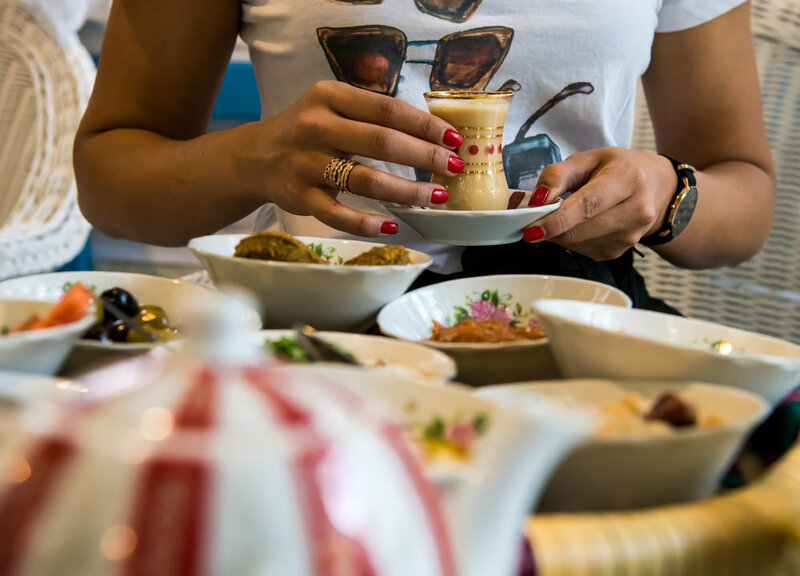 It is open from 7am and is a perfect morning stop to experience a Middle Eastern breakfast – an assortment of small dishes including local specialties like Balaleet – vermicelli cooked with cardamom, cinnamon & saffron and topped with an omelette. During the day, you will dine on dishes like mixed grills, hummus, babaganoush and fresh salads. The Arabic cuisine is enjoyed best as a sharing concept, so ordering many small dishes with a group is ideal. Meals will almost always come with an assortment of breads, pickles and condiments. There is a selection of fresh juices, specialty teas and Arabic coffees to complete your authentic Middle Eastern experience. Try: The Emirati breakfast tray and the Arabian Tea House special breakfast will give you a great selection of traditional dishes to sample. I always like to order either a Karak tea or Red Carnation tea.